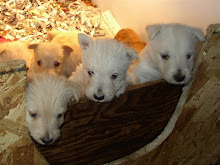 Montgomerie of Camas - AKC Scottish Terriers: only 2 left!! We still have a Male Black from Gayleen (03/27/11) who needs a home. Gayleen is playing with him and sleeping with him because he is so lonely. Click here to see the litter pictures. We have sold all of Lizzy’s litter (04/26/11) except one Black/Brindle Male. Click here to see the litter pictures.